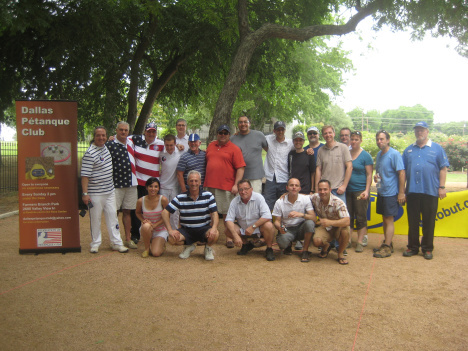 The Dallas Pétanque Club is located in Farmers Branch, TX. Games are on Sunday at 2 pm in Gussie Field Park 2600 Valley View Ln Farmers Branch, TX 75234 at Rawhide Parkway next to the Rose Garden. The terrain was kindly built in April 2011 by the City of Farmers Branch with the Boy Scouts in a beautiful location with tree shade, benches, and lights. 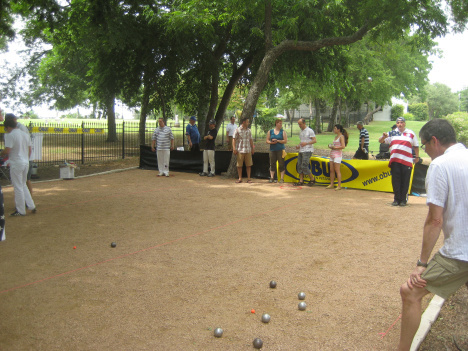 With the growing popularity of Pétanque in Dallas, the terrain surface was doubled in October 2012 with the help of the Boy Scouts. Newcomers are welcome! Come and join us! We have visitor boules and a free introductory lesson for beginners! We are available for corporate events, as well as school programs. Feel free to contact us if you have any questions regarding playing times and location, equipment and any other details.